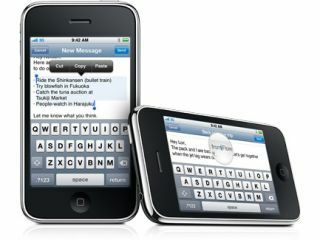 Apple has released its 3.0 software for download prior to the launch of the new iPhone 3G S on 19 June. The features of the new software include cut, copy and paste from a block of text, as well as support for multi-media messaging and landscape keyboard text input. Spotlight search, which searches through all of your contacts, email, calendars, and notes, as well as everything in your iPod and compatible applications, lets you find files that might have become lost in the maze of your iPhone. Other options like tethering to allow the iPhone to be used as a data modem have drawn criticism from users, as the additional costs for mobile broadband data are slightly high. For instance, O2 are charging users £14.68 (for 3GB) or £29.36 (10GB) in order to get mobile data, and the likes of AT&T in the US aren't able to support it at all. There are some cooler upgrades to the iPhone thanks to the 3.0 software, including shake to shuffle, which allows you to change the track playing by shaking the device, and stereo Bluetooth, which means you can listen to tunes wirelessly without loss of audio quality. MobileMe users will also be able to stop worrying about losing their beloved device thanks to Find My Mobile, although that is dependent on someone being kind enough to give it back. Remote wipe is also available should that person be slightly unscrupulous and decide to hand on to it, so at least they won't be privy to sensitive information. Multimedia-wise, voice memos are now part of the iPhone, either via the built in microphone or an external device, and iTunes users can download movies, TV shows, music videos, and audiobooks from the iTunes Store on their iPhone. Hardware add-ons are also compatible with the new software, so things like a portable blood sugar reader for diabetics will also become a possibility. TechRadar has a full hands on with the new software, so check that out if you want to find out whether iPhone 3.0 is really for you before upgrading.